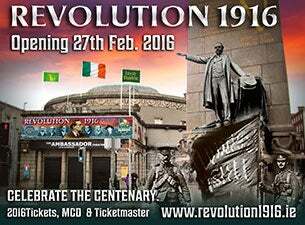 Celebrate the Centenary by paying a visit to the must see Revolution 1916 The Original & Authentic Exhibition. A fitting location for the exhibition, the Ambassador Theatre was formerly the Rotunda Rink and dates back to 1764. It was here on 25 November 1913 that the Irish Volunteers held a mass meeting and many volunteers who took part in the 1916 Rising signed up. During the 1916 Rising, the Ambassador was the backdrop for the famous image of British Soldiers posing with the captured Irish Republic flag held upside down and inside out. Beside the building is where the captured rebels from the G.P.O. and Four Courts garrisons were held out overnight at the front of the Rotunda. The exhibition will feature the largest private collection of 1916 artefacts, with over 500 items on display, on loan from the Irish Volunteers Commemorative Organisation (IVCO). Exhibits will include an original 1916 Proclamation, uniforms from the Irish Volunteers, Cumann na mBan and na Fianna, 1916 weapons including Howth Mausers, German Lugers, Peter the Painter C96 machine pistol as favoured by Patrick Pearse, French Bayonets and even the actual door handle of the G.P.O. from 1916. The exhibition will use the 1916 Proclamation as its overall theme and will examine the “six times during the past three hundred years they have asserted it in arms” as the lead up to the events of 1916. A series of sets will take the visitor through the main locations of the 1916 Rising including The G.P.O., Moore St, and recreating the 1916 Kilmainham landing and walk to the stonebreakers yard. The role of The Irish and Fenian Republican Brotherhood since its formation in 1858 to the establishment of Sovereignty 60 years later after the 1918 elections will be presented in the exhibition. The ratification of the 1916 Proclamation by the First Dáil Éireann on 21st January 1919 with the Declaration of Independence will be featured along with the original sovereign seal. At midday every day a uniformed “Patrick Pearse” will read aloud the 1916 Proclamation outside the Ambassador in what is sure to become an iconic image of the centenary year. “We have put together a special school tour package with student tickets priced at just €8 and each tour booking will receive study notes on the Easter Rising compiled by James Connolly Heron, the great grandson of 1916 leader James Connolly.” said Exhibition spokesperson Bartle D’Arcy. Demand for tickets for this must see exhibition will his year with Dublin set to have over four million overseas visitors alone. Tickets to the exhibition will be date stamped on the Easter Feast Weekend and for all anniversary dates relating to the Rising and will become a memento of your visit in the Centenary Year.